High school students across the United States are getting excited for the upcoming prom and graduation season. All the fun things parents remember about those days still exist: dress shopping, tuxedo rental, flowers, photographs, parties. But there also remains a strong temptation to engage in underage drinking. According to a 2016 poll, alcohol use is the number one social issue students face, especially on prom night. Statistics from the AAA Teen Survey and Mothers Against Drunk Driving indicate the prevalence of drugs and alcohol in the lives of teenagers. A majority of teenagers—75 percent—say they’ve been peer pressured into drinking. Further, 31 percent admit to having used drugs or alcohol on prom night. In turn, 19 percent say they have ridden in a car with an impaired driver. Of all teens involved in fatal automobile crashes, 20 percent were reportedly under the influence. How can we help these bright young stars of tomorrow resist that urge to imbibe today? Here are three steps parents and guardians can take to help keep adolescents safe during these rites of passage and beyond. Set ground rules. A prom-going or graduating student may be just around the corner from adulthood, but you still call the shots. Agree to check-in times to confirm whereabouts and company, and enforce a curfew. Through plain communication, discourage drug and underage alcohol use—it’s illegal and can increase a variety of risky behaviors, including sexual activities for which a teen may not be prepared. Find the exit. Even when all the ground rules have been followed, teens can wind up in unexpected situations where drinking and drugs are present. Equip your student with cash for cab fare if a quick getaway is needed. Also, let your teen know that you (or another trusted adult) will be available any time during the night to provide a safe ride home. Share resources. Reach out to your student in ways that resonate with his or her generation. Teenagers may roll their eyes when an adult tries to talk about drinking and other tough coming-of-age topics, but they might click on a link in a brief, well-timed text with less resistance. 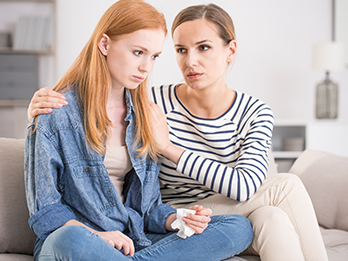 Centerstone’s Teen resources provide free information to help teens, parents and educators tackle issues facing adolescents. Here’s to safe celebrations! May all of your prom and graduation events be carefree as well as alcohol and drug free. Ashleigh Hall is a Prevention Services Coordinator for Centerstone and a Certified Prevention Specialist II with 17 years of experience working with children and their families. Centerstone is a not-for-profit health care organization dedicated to delivering care that changes people’s lives.